So - I was unsure how the old vlog would go over but no one wrote an email telling me I harassed their eyes so we're all good on that front. I got a lot of comments asking me about my accent and what the heck it is. Basically, I'm a mutt. American people think I sound weird and English people think I sound extra weird. I'm totally that kid who gets picked last for dodge ball and I don't fit in anywhere. Hubby liked all his comments. Seriously guys, you gave him such a big head. I swear he's walking around so much prouder today. I've never edited comments before but I'm going to have to go in and delete every reference to a hot, hunky, or funny husband. I spend a lot of time convincing him he's lucky to have me. Don't screw that up for me. I think my favorite compliments were the ones where the commenters said I was "real." Really, if I was going to make up a fake blog persona it would be so much cooler than this. It wouldn't be that hard, honestly. Last night hubby suggested sushi for dinner but my fiscally responsible (aka boring and biatchy) side came out and said no - too many house expenses going on right now and we had plenty of groceries at home. 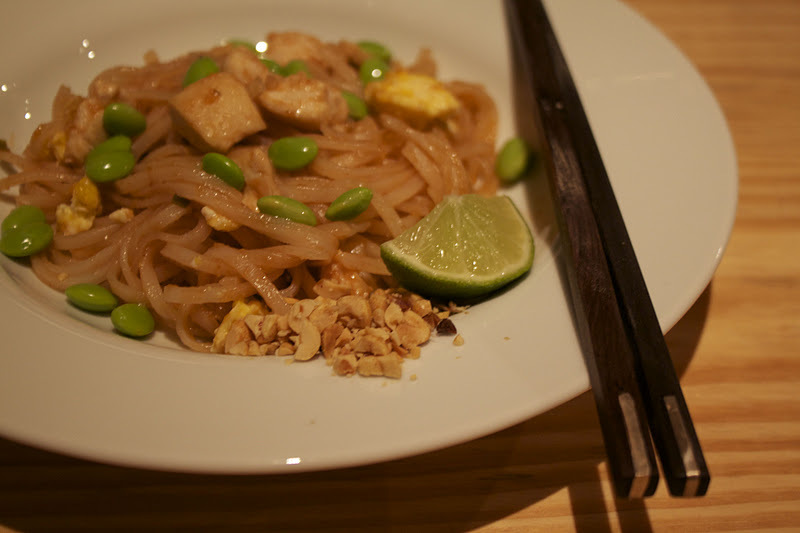 I tried to make it up to him by making some Pad Thai instead. I thought the chopped peanuts and fresh lime would make up for the slight lack of authenticity, but it definitely tasted a little off - thanks to some missing bean sprouts. Two different stores tried to sell me alfalfa sprouts and brussell sprouts instead. Um, no. I tossed in some edamame instead so there could be a vegetable present at dinner. The hint of green made me feel better about eating sweet and salty fried noodles. Heads up to everyone - sadly, the lovely Redonk Runner won't be able to run the Publix Marathon this March. So she has offered another reader the chance to win - thanks to Random.org I picked Gracie from How I Complicated My Life Today. Congrats! Send me an email if you are still interested in running the race for free on March 18th. Do you have an accent? What things do you say differently? I guess a slight one...it's funny though because some things I say with SUCH an American accent, and others the Brit comes through. I got made fun of as a kid for how I said the letter "H" and I never got it. I still forget which way to pronounce it now. Haich or aich? Do you like Thai Food? Favorite dish? So much! I know some people consider Pad Thai to be the most boring, simple dish on every Thai restaurant's menu but I love it. I'm also a fan of mild green curries - so good. I am a huge fan of pad thai, but I think my favorite thai food is yellow curry, I adore it, yum!! Or pad pra ram, peanut sauce is to die for!! We eat lots of bean sprouts at our house, in salads and the two oldest girlies and I just eat them alone, so good. These comments look different - just an observation. Hmmm. Accent - nope, didn't notice . . . perhaps you're meant to live in Indiana - you sound a lot like us . . . welcome to the Hoosier state :) hee hee. I love Asian noodles - is that pad thai? If so then YES, huge fan! I'm glad that your vlog was a success and that your husband's ego was enhanced as a result - win win. I still love the accent! I told Colin to watch it and he agreed /w me - you sound like Angelina Jolie! LOVE :) tomb raider!!! Pad Thai is my favvvvvvorite dish in the world. 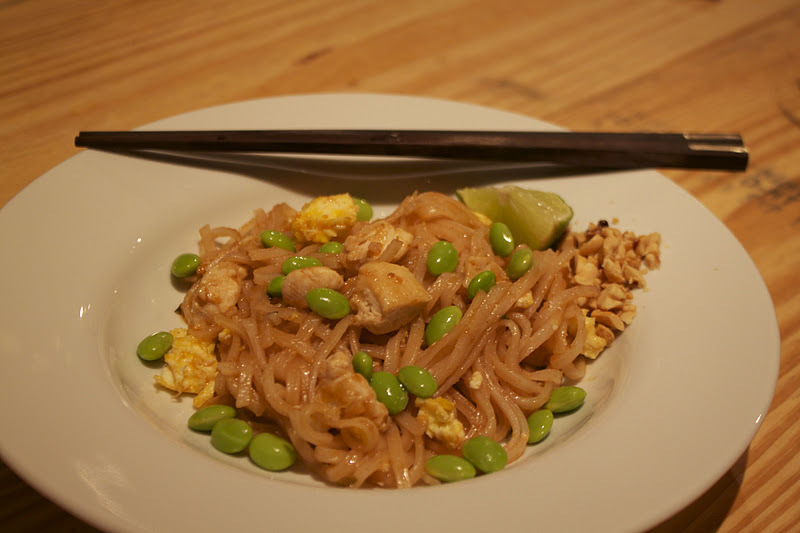 Seriously I could eat Pad Thai morning, noon and night. I think you sound like Heidi Klum- can't go wrong with that right?! Okay, I just tried to go back and rewatch the video and listen to your accent again, but it says it's currently unavailable. :/ I didn't notice it being weird at all. I was expecting more of a British accent! I don't think I have an accent at all, but my yankee friends tell me differently. lol I think THEY have the accent. Mmmmmmmmmmmmmmmm..... Thai food. Would you believe that I only tried it for the first time when I was in VA last November? I knew I liked other Asian cuisines, but I had never had Thai. And, funny enough, Pad Thai with tofu was what I ordered. It was delicious! Mmmm mmm I love pad thaii to death!!! Even if it was lacking it looks pretty awesome, I'd like to making my own. I've never met a Thai food I didn't like. Yum! That's a great picture of you two. You look very pretty by the way :) Maybe I am used to seeing you with the hair up most of the time?? I know that mine is up when the pics are running related! I love Thai Food. I have a great place near my house that has the best food for super cheap. I love the beef sate, cucumber salad, won ton soup,thai iced tea and the pad see eww (spell check). Okay now when I read your posts I read them with an accent. Makes it so much more fun :) Hubby IS lucky to have you because you are equally as gorgeous so your head should be just as big, if not BIGGER!!! I don't think I have an accent but maybe Americans or such would think I do? Julia probably thought I had an accent when she visited and she sure had an American one!! It's so hard to tell though when everyone around me talks the same! I haven't really had Thai food many times but the times that I have, I've ordered Pad Thai or mango salad. I always tend to play it safe! PS - the font of your comments is different today! At least on my end it is! Seriously love your blog and I loved watching your vlog! I like your accent! It's so cute. 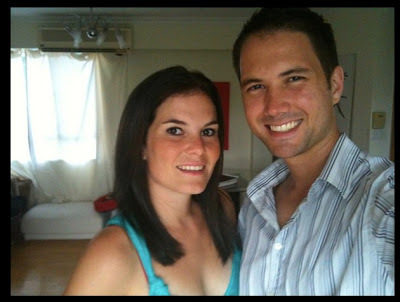 I just watched your video and you and your hubs are adorable. Congrats on 500 followers. Not surprised since your blog is so great! I don't think I have an accent but since I'm from California, I probably have one. People say we say our A's weird. I LOVE Thai. My fav is Pad Thai and Pineapple Fried Rice. Sometimes I'll go for the Pad See Ew...or whatever it's called. One time ONE commenter mentioned that my husband was good looking and that's when he banned me from putting his picture up. Something about "I refuse to be eye candy for your creepy blog readers!" Strange, I know. Dangit! Now I wish I'd been able to see the video, but every time I click on it, it says it's unavailable! I don't have an accent, I actually worked really hard to get rid of my southern accent when I moved north, so I wouldn't get made fun of in school. now I wish I hadn't. You look gorgeous in that first pic!! I missed the vlog too....maybe it'll pull up for me! I love pad thai! yum! As many have said, super sweet photo of you both. Some think I have an accent. I say things like ya'll and Saturday is pronounced Sah-dur-day. But it only comes out on some words. Your dinner looked yummy to me! No accent here and I am from Maine so I am glad I don't have one! The New England accent can be a little rough on the ears sometimes! I haven't picked up the Rochester, New York accent yet either. I've had Thai food once or twice and it's pretty good. My husband wants to try it sometime. I rarely eat Thai food, but Pad Thai is my favorite. Yum! As for an accent, it's fairly Southern. My yankee hubby says I'm pretty neutral, but I guess it's all relative. I say things like tuque, chesterfield, loonie, etc...it is always funny when I say things and Americans have no idea what I just said...I just assume everyone in the world knows what poutine is ya know? By the way..thai food is awesome! love the pics, they always make me laugh! Sadly, I've never tried Thai food, I'm so boring! Looks yummy though! Hmm, I'm from Texas so I'm sure people think I have a "country" accent, but I really don't! hmm Tripp and I tried to make Pad Thai once, it wasn't pretty, or yummy - an all around #fail - yours at least looks appetizing!! I don't think I have an accent, but who knows - I should probably do a vlog at some point! I JUST convinced myself that I should not stop at Lemongrass for Thai carryout and that I should go home and make something...then I checked your blog. Now I must have carryout! Any time I've tried to make Asian food at home it has been a disaster, not sure where I go wrong. I can't wait to hear about a race with Gracie, she's a speed demon and her blog is one of my favorites (along with GR of course)!